Palmer & Co's Express, shield handstamp on blue folded letter datelined "San Francisco Novembr 15 1850" to New York N.Y., endorsed "p Palmer & Co's express" at bottom left, carried by PMSS Tennessee from San Francisco Nov. 15th to Panama arriving Dec. 1st, across the Isthmus to Chagres and carried by Cherokee to New York arriving Dec. 20th, docketed as "Rec December 23", letter states "You will receive per Palmer & Co's Express One Package of Gold…40½ oz…", F.-V.F. Thomas No. PAL-100a. ONE OF ONLY 5 RECORDED PALMER & CO'S EXPRESS SHIELD HANDSTAMPS. C.S. Palmer had established offices in Boston Mass. and New York, N.Y., and in March 1850 expanded westward by establishing offices in San Francisco, Sacramento and Marysville. His handstamps are not seen after early 1851. There are only five recorded strikes in two colors, black and red. 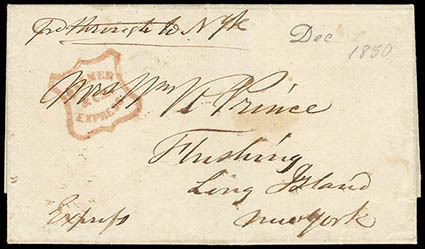 Palmer & Co's Express, bold strike of red shield handstamp on folded cover with pencil "Dec 1850" dating to Flushing, Long Island, N.Y., bold clear strike of red "Palmer & Co's Express" shield handstamp, endorsed "pd. through to N. Yk" at top and "Express" at bottom, Very Fine, ex-Haas. Thomas No. PAL-100b Estimate $2,000 - 3,000. Apparently, Palmer carried this letter beyond his office to Flushing N.Y., as there is no evidence of it having entered the mails. 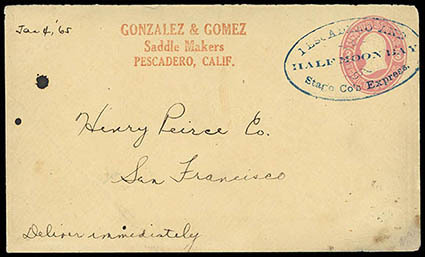 Pescadero & Half Moon Bay Stage Co. Express, blue frank handstamp cancels 3¢ pink (U35) buff entire to San Francisco Cal., printed red "Gonzalez & Gomez, Saddle Makers, Pescadero, Calif." return address, endorsed "Deliver immediately" at bottom left, manuscript "Jan 4, '65" dating, part of flap missing, couple small stain spots, Very Fine, ex-Pearce. Thomas No. PSE-100 Estimate $1,500 - 2,000. A BEAUTIFUL EXAMPLE OF THE OF PESCADERO & HALF MOON BAY STAGE CO. EXPRESS FRANK. River Expres, Stockton & San Francisco, green frank on 2¢ green entire cancelled by blue "River Express Co., San Francisco, Cal." 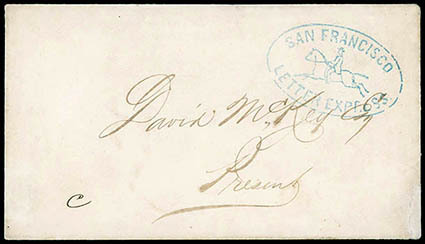 double-oval datestamp (RIV-100) to San Francisco, Very Fine. Thomas No. RIV-001 Estimate $300 - 400. This company existed under a variety of proprietors as a freight, storage and package forwarder around the San Francisco Bay area. It operated primarily between Stockton and San Francisco, but had agents or offices in Alameda, Antioch, Benicia, Berkeley, Napa, Oakland, Petaluma and Vallejo. 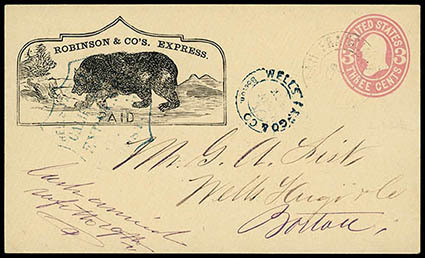 Robinson & Co's Exress, printed illustrated paid frank showing grizzly bear on 3¢ pink (U59) buff entire to Wells Fargo & Co., Boston Mass., partial strike of Wells Fargo & Co., California Express, Boston" shield frank and matching "Wells Fargo & Co., Boston, Aug 10" double-circle datestamp, Very Fine, WC6670, ex-Barkhausen, Dale-Lichtenstein; with 2004 P.F. certificate. Thomas No. ROI-700 Estimate $2,000 - 3,000. ONE OF ONLY TWO RECORDED USED EXAMPLES OF THIS DESIRABLE ROBINSON & CO'S EXPRESS ILLUSTRATED GRIZZLY BEAR FRANK. 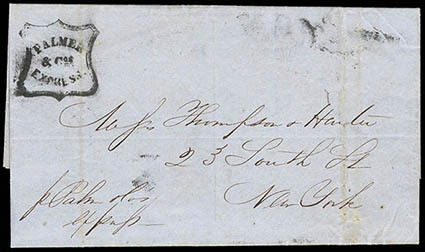 San Francisco Letter Express, blue oval Running Pony handstamp on locally addressed cover; small repair lower right, lightly cleaned, Very Fine appearance, ex Dale-Lichtenstein. 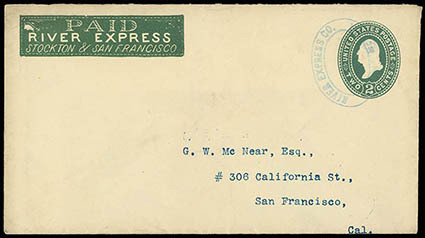 San Francisco Letter Express., blue printed rectangle frank and rectangular "PAID" handstamp on light buff cover to D.W. Cheeseman, U.S. Mint, San Francisco, pencil "3 P.M.", Very Fine, ex-Saltzer. 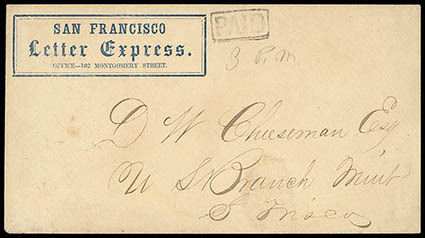 ONE OF ONLY TWO RECORDED EXAMPLES OF THE SAN FRANCISCO LETTER EXPRESS PRINTED FRANK, THIS BEING THE ONLY RECORDED IN BLUE. The other recorded printed San Francisco Letter Express printed frank is in black with the same rectangular "PAID" handstamp adjacent. It was offered in the 2004 Dale-Lichtenstein sale (lot 1261). 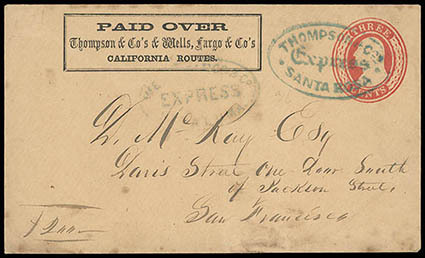 Swift & Co's Express, Paid, printed rectangular frank on 3¢ red (U10) Nesbitt buff entire cancelled by blue "Wells, Fargo & Co., Express, Petaluma" oval handstamp to San Jose Cal., F.-V.F. 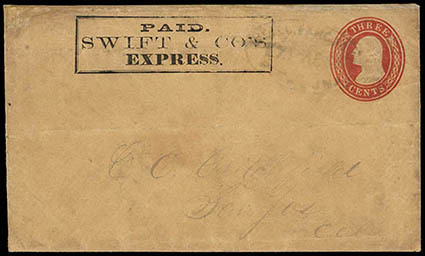 appearance, One of only four recorded examples of this Swift & Co's Express frank. Thomas No. SWI-002 Estimate $300 - 400. E. Swift operated an express on the peninsula north of San Francisco. This operation ran from a base at Santa Rosa and followed present day highway 101 north to Cloverdale and possibly Ukiah. It also extended west from Santa Rosa to Bodega Bay area. This express connected with Wells Fargo at Petaluma and Santa Rosa. 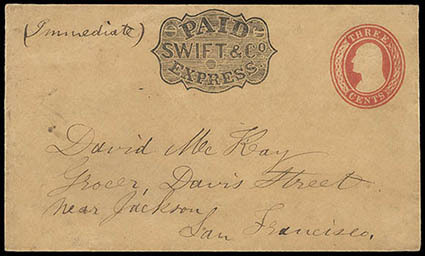 Swift & Co. Express, Paid, fancy printed shield frank on 3¢ red (U10) Nesbitt buff entire endorsed "Immediate" to San Francisco Cal. ; flap and edge repairs, Very Fine appearance, ex-Barkhausen. Thomas No. SWI-001 Estimate $200 - 300. Paid Over, Thompson & Co's & Wells, Fargo & Co's California Routes, printed frank on 3¢ red (U10) buff Nesbitt entire to San Francisco Cal., docketed "$200" at bottom left, ex Dale-Lichtenstein. ONE OF ONLY FIVE RECORDED EXAMPLES OF THIS CONJUNCTIVE THOMPSON & CO'S AND WELLS FARGO FRANK, ONE OF WHICH IS IN THE WILTSEE COLLECTION. E.B. Thompson ran a small operation from Petaluma to Santa Rosa, and on to Healdsburg Cal. He connected with Wells Fargo at Santa Rosa and acted as a feeder route for them.